A 78-year-old man with a past medical history of rectal cancer presented to the emergency department with upper abdominal pain, increasing confusion, and urinary incontinence. A physical exam was unremarkable with temperature of 97.7 F. Laboratory data revealed a normal white blood cell count of 10.9 and cloudy urine positive for leukocyte esterase and WBC >50. Patient was admitted for urinary tract infection and given intravenous antibiotics. On hospital day 2, a CT of the abdomen was obtained for persistent low grade fevers. 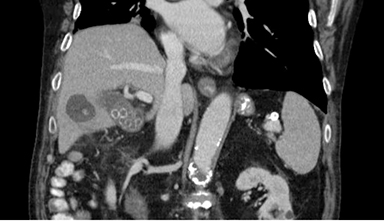 Contrast enhanced CT of the abdomen with coronal reconstructions demonstrates a 3.5 cm intrahepatic fluid collection in the right hepatic lobe (Figure 1). Multiple gallstones are present within this fluid collection. Review of the axial images reveals a direction communication between the posterior inferior wall of the gallbladder and the fluid collection (Figure 2). Additionally, there is mild heterogeneous enhancement of the surrounding liver parenchyma from localized inflammation (Figures 1 and 2). 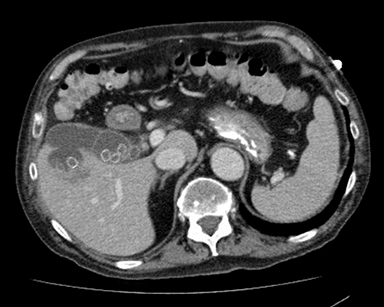 The gallbladder was not visualized on HIDA scan (Figure 3), confirming acute cholecystitis. Ruptured cholecystitis with intrahepatic biloma containing multiple gallstones. Gallbladder perforation is uncommon but well described in the literature. This complication occurs in 2-10% of cases of acute cholecystitis. (1) With the increase in cholecystectomies in modern surgical practice, gallbladder perforation is becoming rare with a reported incidence of 0.8%. (2) The pathophysiology leading to perforation involves obstruction of the cystic duct, biliary stasis causing increase in the intravesicular pressure, leading to gallbladder dilatation and eventual perforation.1,3 Niemeier classified gallbladder perforation as acute (type I) if there is generalized peritonitis, subacute (type II) if the peritonitis is localized or if there is a pericholecystic abscess, and chronic (type III) if there is a cholecystoenteric fistula.4 If the rupture occurs along the under surface of the gallbladder then peritonitis with extraluminal fluid collection occurs. If the rupture occurs along the liver surface of the gallbladder then an intrahepatic biloma or abscess may form. Intraheptic bilomas secondary to gallbladder perforation have rarely been described in the literature.1,3 Our case is the first to demonstrate back filling of the intrahepatic biloma with multiple gallstones following the perforation. This patient underwent percutaneous ultrasound-guided cholecystostomy tube placement because the patient was deemed a high risk surgical candidate. Patient was discharged after resolution of fevers and improved mental status. Elective cholecystectomy was planned for after the percutaneous drain was removed. Intrahepatic biloma is a rare complication of perforated acute cholecystitis. Early and accurate detection has significant impact on clinical management. Imaging and interventional radiology play an important role in the diagnosis and management of complicated perforated acute cholecystitis. Taneja S, Sharma A, Duseja AK, et al. Spontaneous perforation of gallbladder with intrahepatic bilioma. JCEH. 2011;1:210–211. Kochar K, Vallance K, Mathew G, et al. Intrahepatic perforation of the gall bladder presenting as liver abscess: case report, review of literature and Niemeier’s classification. Eur J Gastroenterol Hepatol. 2008;20:240–244. Hollanda E, et al. 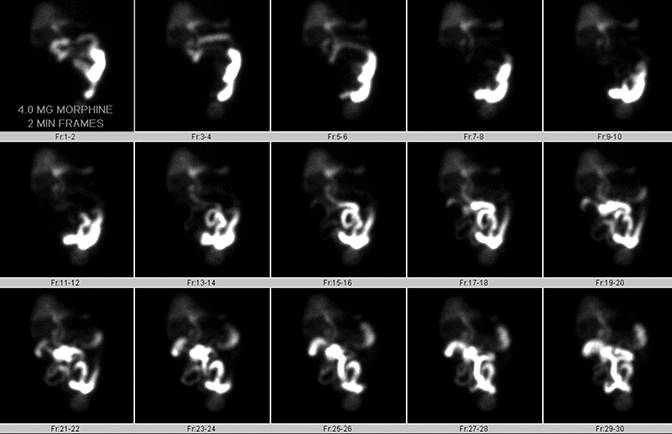 Spontaneous perforation of gallbladder with intrahepatic biloma formation: sonographic signs and correlation with computed tomography. Radiol Bras [online]. 2013;46:320-322. Neimeier OW. Acute Free Perforation of Gallbladder. Ann Surg. 1934;99:922-44. Date RS, Thrumurthy SG, Whiteside S, et al. Gallbladder perforation: case series and systematic review. Int J Surg. 2012;10:63–68. Patel J, Chang J, Mirza R. Intrahepatic biloma from ruptured cholecystitis. Appl Radiol. 2017;46(5):31C-31D. Prepared by Dr.Patel, Dr, Chang, and Dr. Mirza while at Banner MD Anderson Cancer Center, Gilbert, AZ.